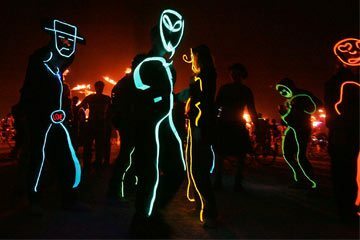 There are many questions regarding the proper method to allow designers and DIYers to make their own EL Wire costumes. Here are some of the basics to get you started with your own EL Wire costume projects. Rather than describe how to make a single specific design, these instructions are general in order to create an EL Wire layout for almost any type of costume. Use these EL Wire costume suggestions and then take things a step further using these techniques to create original designs. The best and most secure installation method is to sew the EL Wire to your costume. It is never advised to use sewing machines when creating EL Wire costumes. It is too easy to pierce the EL Wire with a machine needle, which will cause it to short out and fail. EL Wire should be hand stitched in place. A great method of attaching the EL Wire is to clear or mesh channels into your costume to accept the EL Wire. This method is very time consuming, but allows for removal of the EL Wire for replacement or to wash the costume. Use upholstery thread to attach EL Wire. Any color works, but matching your garment’s color is best. You will hardly see the thread over the El Wire. Avoid clear plastic thread. It doesn’t tie well. An alternative to sewing is to use a Buttoneer. This product is available online and at fabric stores, and uses small plastic loops to secure the EL Wire in place. Once again, be sure not to puncture the EL Wire with the Buttoneer needles. Tie off the ends of your thread very well and pull stitches tight over the EL Wire and connectors for best durability. Stress between the El Wire and connectors can be damaging. Alleviate this by paying special attention to quality in these areas. Use 1/8” stitch spacing on curves and 3/8” to 1/2” spacing on straight sections. Use a garment pencil to mark the EL Wire run locations. If you choose to trim the EL Wire to length, you will need a sharp scissor or bypass wire cutter. Cut the end of the EL Wire to length before you sew it on all the way and turn the wire on to test the cut. A bad or jagged cut will short the wire and it won’t light. If this happens, make a new clean cut just above the old cut and test again. Once you have a good clean cut, install a clear plastic cap on the end of the EL Wire. Since EL Wire is very fragile, costumes where it is flexed repeatedly should be avoided. Focus should be on methods for improving durability and getting the longest possible life out of the EL Wire costumes.